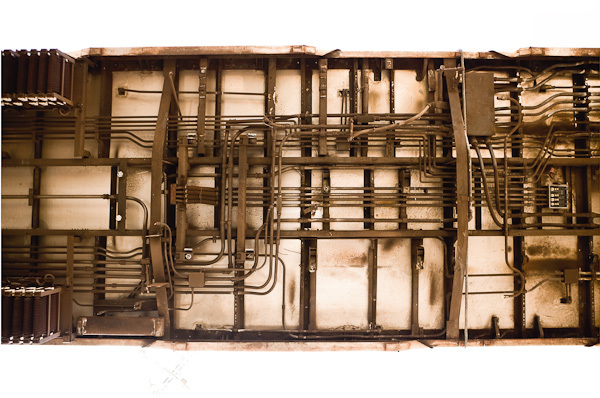 Stephen Mallon is a Brooklyn based industrial, art, and industrial art photographer. 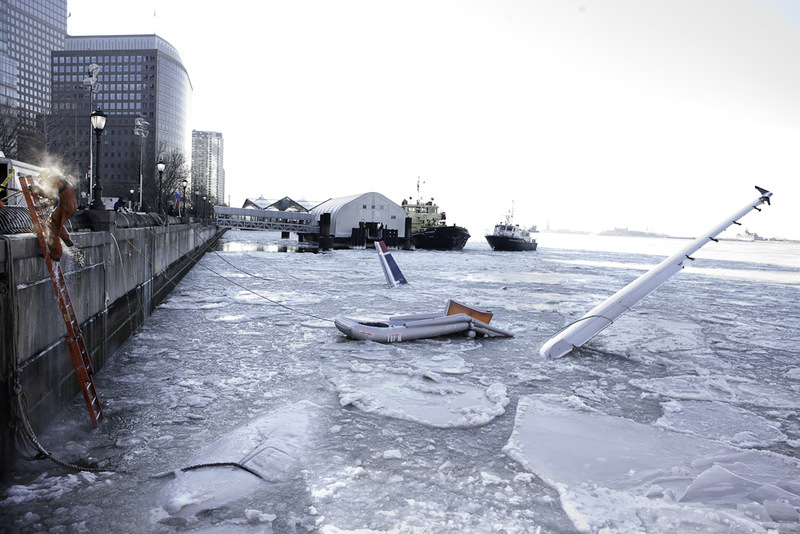 His photographic documentary of the salvage of Flight 1549 (the one that Sully landed safely on the Hudson) resulted in some stunning art work and generated a lot of buzz in the media. 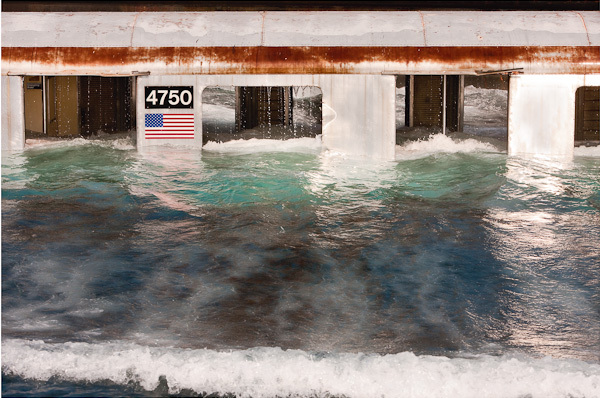 His project about the sinking of old subway cars in the Atlantic to build reefs can be seen in his upcoming show “Next Stop Atlantic” at the Front Room Gallery in Williamsburg, Brooklyn. Stephen graciously agreed to share the nuts and bolts of this project during an interview for the The Heavy Light. Dirk Anschütz: Let’s start at the beginning. When and why did you decide to become a photographer? Stephen Mallon: When I found out I couldn’t become a pilot (because of spinal meningitis at age 15) I started to follow other interests. At that time I had a Kodak Instamatic, after that I upgraded to a Kodak Disc Camera, then I “stole” my Dad’s Canon AE1 and so on. I took some photo classes in High School, worked for the student newspaper and finally went to RIT in Rochester. DA: Did you shoot industrial images straight out of college? SM: No my first passion out of school was fashion photography. DA: That’s a hard field to establish yourself in. Did you get a lot of work in fashion? SM: Well, I had a few jobs for Maxim which in turn led to an ad job for Canadian Club Whiskey, but….. There were quite a few editors who liked my work, but suggested that I start using “real” people as models and take it more in a lifestyle direction. Especially for stock. DA: So, what caused the switch to industrial photography? SM: A conversation with my CD at Photonica Karen D’Silva. I had traveled to Africa in 1999 and showed Karen some landscapes I’d taken in Niger. She liked them, but told me that they needed some kind of human footprint to become commercially viable. DA: So what was your first industrial photo shoot then? SM: Well, I’ve always shot industrial stuff. Even in high school I loved shooting mechanical things. I’ve shot airplanes and airfields. Once a pilot phoned in to tell the airport that they really shouldn’t let a photographer sit on the runway. I just lost my way a little bit in college. DA: Let’s talk about the subway shoot. 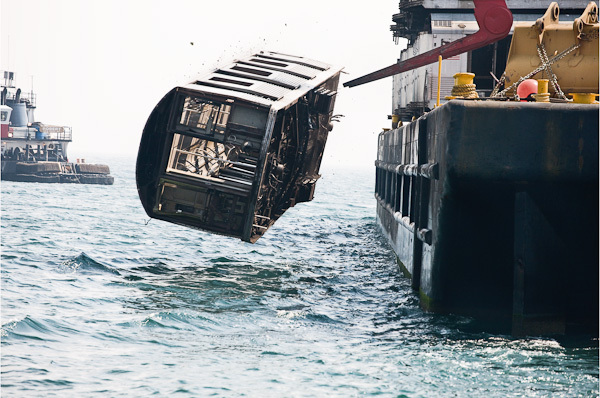 How did you learn about the fact that old subway cars were being dumped in the ocean? SM: I’d first read about it in the New York Times in maybe 2004 and I thought that project was all finished. 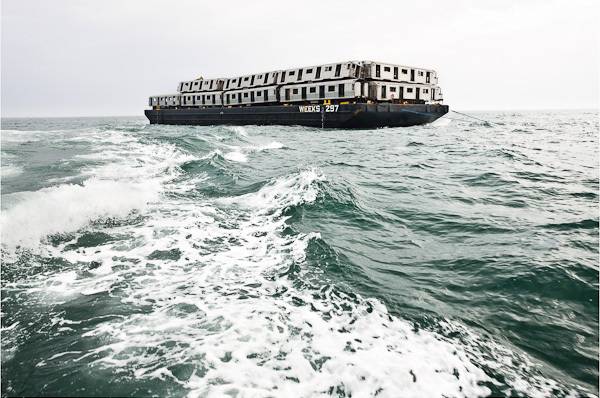 But in April 2008 I spotted a barge loaded with subway cars while location scouting in New Jersey. I drove to adjoining yard which belonged to Weeks Marine, the company that turned out to be the owner of the barge. 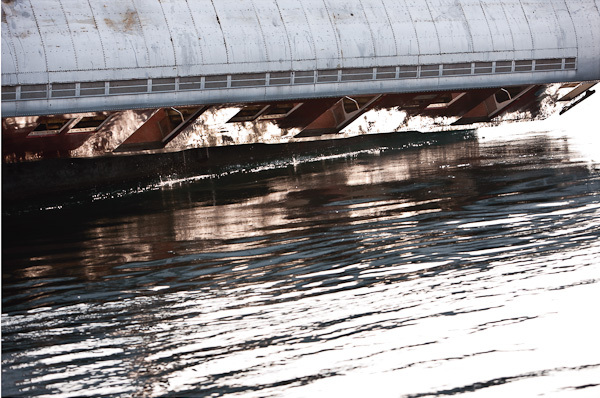 I talked to the security guard and told him that I was interested in photographing the barge. The guard passed me on to Lou, the yard manager, and Lou passed me on to Jason, the senior engineer. I told Jason about my ongoing photo project about recycling “American Reclamation”, and gave him my website. He was himself interested in photography and liked my work, and after I secured permission to photograph from the MTA (Metropolitan Transit Authority) he gave me full access to the “loadout”. 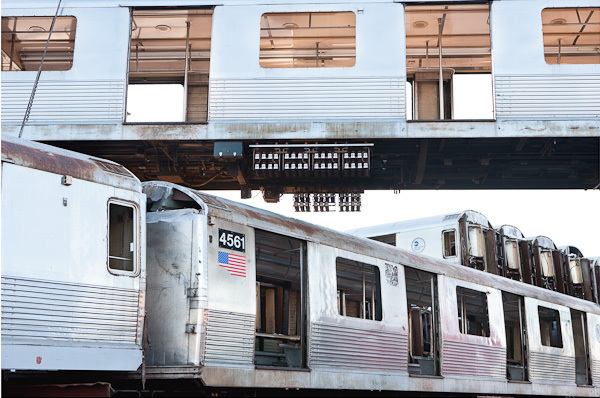 When the loadout came I drove to the 207th Street rail yard in the Bronx where the old stripped down subway cars were loaded onto Barge 297. It took about 2 days to load the barge with as many cars as possible. Then the barge shipped back to Bayonne, NJ where it sat for a few days. I wasn’t allowed on the loaded barge for safety reasons. I was also not allowed to stand under subway cars for safety reasons, but I only found that out later. Finally Jason called that they were ready to head out to the drop site. 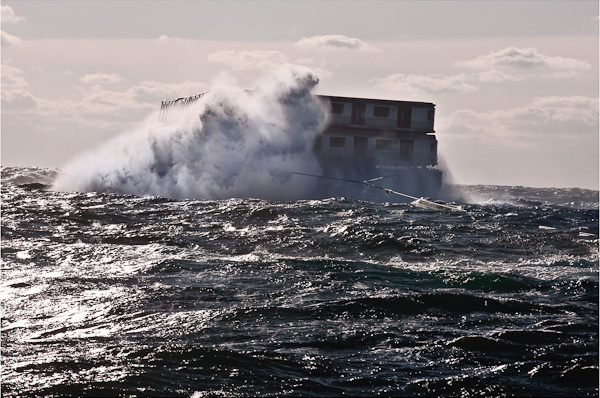 I set up on the crew boat on May 16th while a tugboat pulled the barge out on the Atlantic to a spot off the Maryland coast. DA: How many shoot days did you have during this project? 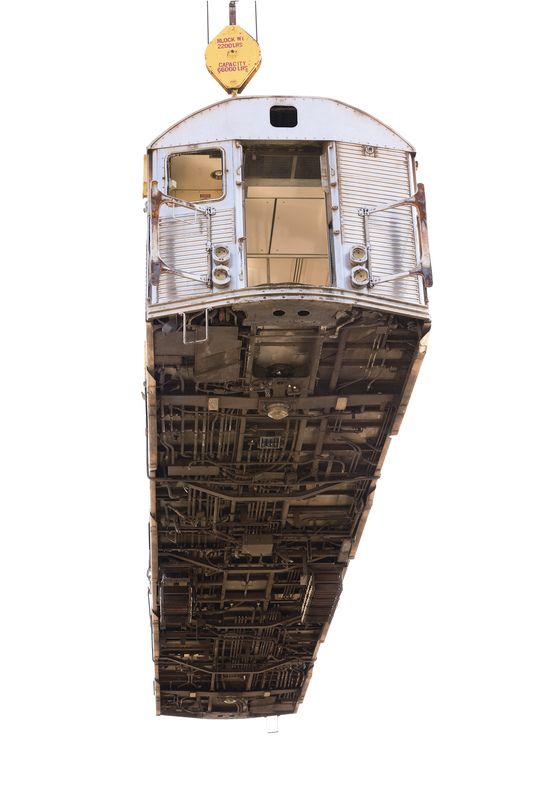 SM: The subway cars were dropped off the coasts of Maryland, South Carolina, Virginia, New Jersey, Delaware and Georgia. I went to 4 drops and 2 loadouts. DA: What equipment did you use? SM: I shot with a Canon Mark III DS and 4 lenses. A 24-70 f 2.8, a rented 70-200 f2.8 with image stabilizer, a 70-200 f 4, and a 17-40 f 4. DA: What were the technical challenges? SM: On a boat everything is moving. I had to use pretty high shutter speeds since things happened very fast. I usually shot 1/500th at 400 ASA. I was tracking the action like on a sports shoot. Almost everything was shot with the motor drive on high. Oh, and one more thing: Don’t try to preview your images on the back of the camera while shooting- HELLO MOTION SICKNESS! DA: Tell me how this personal project has influenced your career so far. SM: The subway project was what introduced me to Weeks Marine, so when the plane went down in the Hudson, I called Tom Weeks to see if they would do the salvaging. When they got the job, Tom asked me if I wanted to work. I had to get permission from National Transportation Safety Board and after that got full access to the proceedings. I had been staying in touch with Front Room Gallery for about 3 years, showing them my work and going to openings, so when they saw my series “Brace For Impact: the aftermath of flight 1549” they decided to give me a solo show. That work also got a Lucie Award and led to a commercial assignment for Maytag, which turned out to be the biggest job of my career so far. 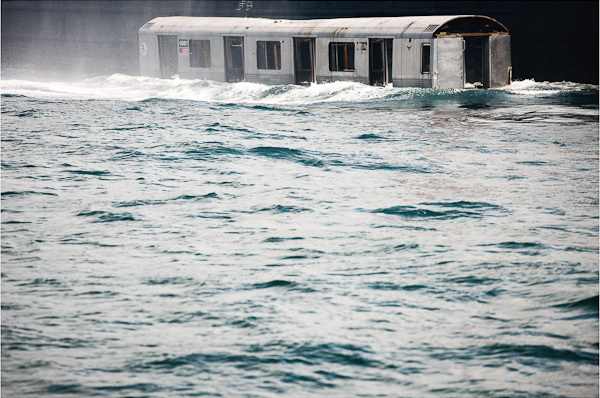 The image of the floating subway car made it into the Communication Arts Photo Annual and the subway work will be shown at the Front Room Gallery in September. It’s just great how it segued from a personal project to an art project to assignments to another project and so on. DA: Thanks a lot for the interview and good luck with your show. Stephen Mallon‘s show “Next Stop Atlantic” will open at The Front Room Gallery in Williamsburg, Brooklyn on September 10th. All images in this post ©Stephen Mallon. Nice! Congrats on the show Steve. Is the image titled ‘Settling? I’m imagining the train cars are like the settlers of the American West somehow. ΠΛΕΩΝ ΔΕΝ ΥΠΑΡΧΟΥΝ ΑΝΘΡΩΠΟΙ ΕΙΝΑΙ ΟΛΟΙ ΑΠΑΤΕΩΝΕΣ ΔΑΙΜΟΝΕΣ, ΤΑ ΠΑΝΤΑ ΘΑ ΚΑΤΑΣΤΡΑΦΟΥΝ ΕΝ ΡΥΠΗ ΟΦΘΑΛΜΟΥ, ΕΞΑΙΤΙΑΣ ΤΗΣ ΜΗ ΔΙΚΑΙΩΣΗΣ ΜΟΥ, ΔΙΟΤΙ ΕΧΕΙ ΓΕΜΙΣΗ ΠΛΕΩΝ Ο ΠΛΑΝΗΤΗΣ ΠΟΥΤΑΝΕΣ ΚΑΙ ΠΟΥΤΑΝΟΥΣ ΑΠΑΤΕΩΝΕΣ ΠΟΥ ΕΧΟΥΝ ΔΑΙΜΟΝΙΣΘΕΙ. ΔΕΝ ΕΧΩ ΒΡΕΙ ΚΑΛΟΥΣ ΑΝΘΡΩΠΟΥΣ ΓΙΑ ΔΙΚΑΙΩΣΗ , ΣΥΝΕΡΓΑΣΙΑ. ΚΑΛΟ ΤΕΛΟΣ ΤΩΝ ΠΛΑΝΗΤΩΝ ΣΑΣ ΕΥΧΩΜΕ ΣΕ ΟΛΟΥΣ ΣΑΣ. Isn’t it funny despite the high cost of scrap metal the MTA decides to dump these in the ocean instead of sell them for scrap? It would be a hell of a lot better than raising fares.